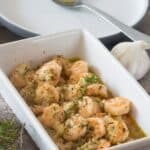 Garlic butter sauteed shrimp recipe – A dairy free butter sauteing an mass of shrimp served in a tasty herbaceous garlic sauce. 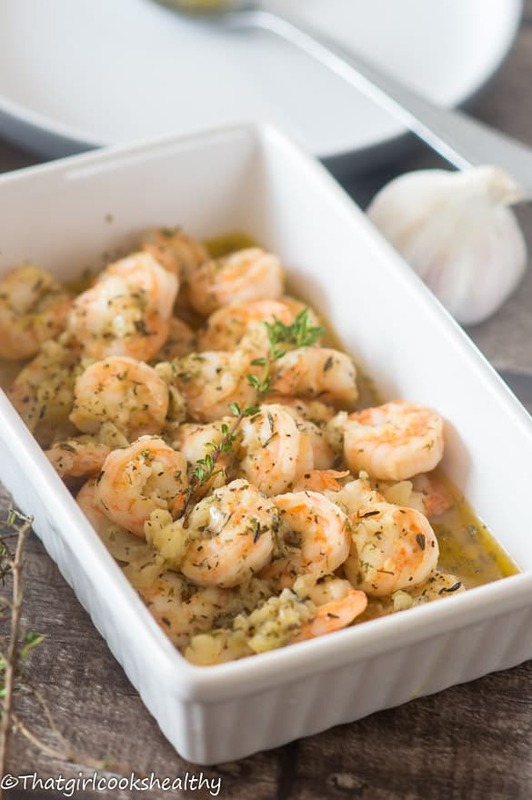 This garlic butter sauteed shrimp is the ultimate seafood lovers recipe and one that is my absolute favourite might I add. What I like about this recipe that it’s quick, easy to make and incredibly tasty, though you may need a few extra strong mints to ward off that garlic breathe. Anyway, this is my go to recipe when I’m in the mood for some seafood that isn’t too complex to make. A good time to utilise a recipe such as this one would be on week nights, where I know the majority of you are busy whether you’re a student, parent or a singleton it doesn’t matter, the aforementioned needs something that is quick to prepare, cook and fill the tummy, sounds like a reasonable demand to me, don’t you think? 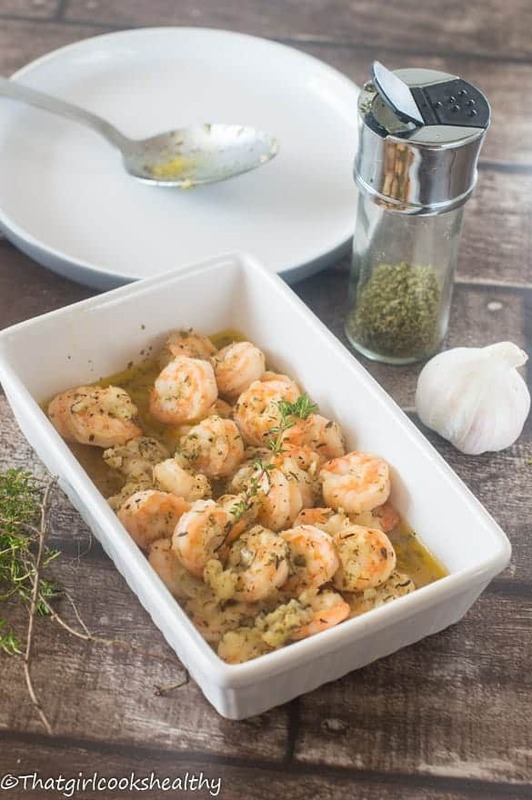 Well this tasty garlic butter sauteed shrimp will meet your demand, you don’t need to purchase any additional ingredients as the majority of what you need are some of your pantry essentials – black pepper, parsley, thyme, pink salt, thyme, onion and dairy free butter (kept in the refrigerator of course). Prepare the garlic and onion ahead of time – When I’m extremely busy I usually prep the garlic and onions in advance, it might not make much of a difference to you but if you’re like me and just want to cook things without additional fuss then the minor things such as having chopping up garlic and onions at the ready will be greatly appreciated. Here’s a tip, have some frozen, thawed out and ready to use. Use raw shrimp – Also, I would recommend cooking with raw shrimp especially if you’re a novice to cooking because shrimp doesn’t take very long to cook, especially if you’re handling cooked shrimp (the pink ones) which have a tendency to yield a rubber texture if overcooked. 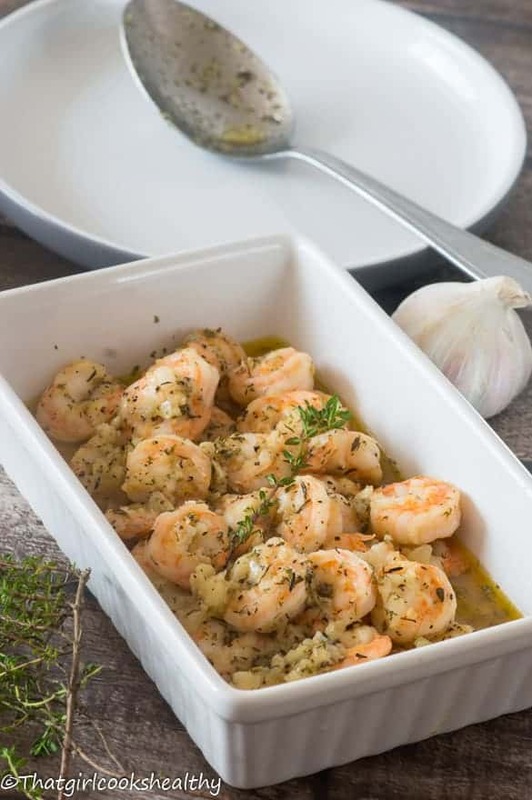 Devain the shrimp – This is a common mistake many people make and one which can be circumvented by choosing raw shrimp don’t forget to de-vain them by scoring them vertically with a paring knife and discard the dark vain. On high heat quickly melt the coconut oil in a skillet until it starts to smoke. Reduce the flame to medium then melt the dairy free butter. Stir in the minced garlic and onion then proceed with sauteeing until translucent. Add the raw shrimp and coat with the garlic butter mixture. Season with parsley, thyme, black pepper and squeeze of lime, continuing to cook until the shrimp turns pink. Raw shrimp usually take 5-7 minutes to cook thoroughly. Remove from pan and serve accordingly. Shrimp is one of my husband’s favorite things but truthfully I’ve never made it! This recipe woud be perfect! All those wonderful herbs and garlic…mmmm…that looks so good! This is so simple and so utterly delicious! These look gorgeous and simple! And thanks for the shrimp tips. I always find cooking seafood so intimidating since I don’t do it enough! You are welcome Tracy. I had the same encounter when I first started cooking shrimp so thought others could benefit from what I have learnt.